Federal Politics: Tories lead by 7; NDP down 6 and Liberals up 5. A majority of Canadians now think the country is headed in the right direction. According to a new national survey from Ottawa-based Abacus Data, the Conservative Party of Canada has opened up a seven-point lead over the federal NDP thanks to a rise in Liberal support largely at the expense of the NDP. Nationally, the Conservative Party has the support of 36% of decided voters (+1 since September) compared with 29% for the NDP (-6 since September) and 22% for the federal Liberal Party (+5 since September). The Bloc Quebecois and Green Party support was unchanged at 7% and 6% respectively. This is the first time since the 2011 federal election that the Liberals have been at 22% nationally. Regionally, the Conservatives lead in Alberta (60%) and in Ontario (43%) while the NDP is ahead British Columbia (40%). In Quebec, the NDP is now statistically tied with the BQ (BQ 31% vs. NDP 30%) while the Liberal Party support in Quebec is up to 21%, an 8-points increase since September. The Conservatives continue to lead among men (38% CPC vs. 30% NDP) and have taken a small lead among women (34% CPC vs. 28% NDP vs. 24% LPC) largely the result of a vote-split among the NDP and Liberals. This month Abacus Data asked respondents to select three issues from a list of national issues that they felt were most important to them right now. Overall, a majority of respondents selected health care (65%) and the economy (52%) in the top three issues selected. Jobs (26%), education (24%), and retirement security (22%) rounded out the top five (see table for other issues). The top five issues selected by Conservative Party supporters were the economy (67%), health care (60%), pensions and retirement security (27%), government spending and deficit (27%) and keeping taxes low (23%). 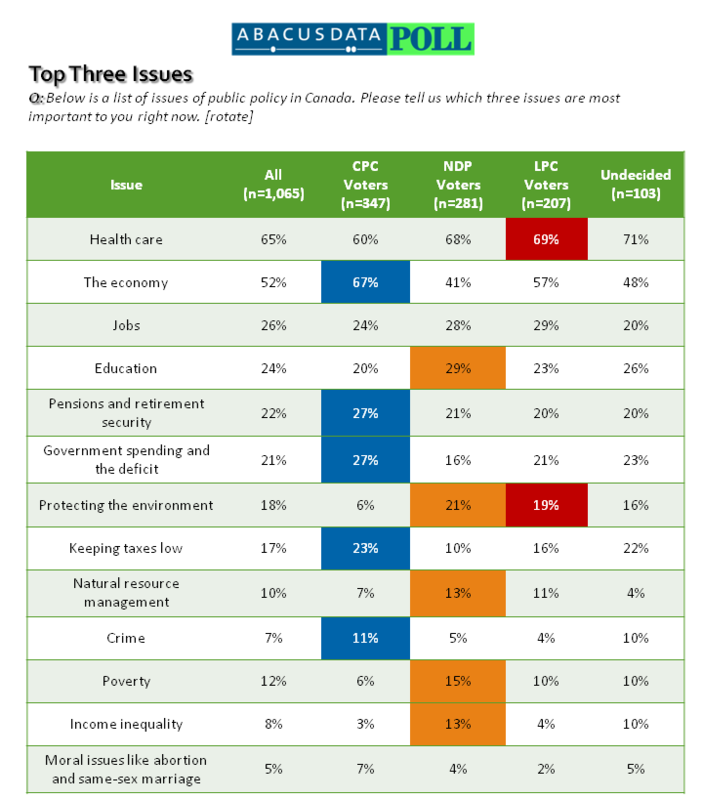 For NDP supporters, the top five issues selected were health care (68%), the economy (41%), education (29%), jobs (28%), and protecting the environment (21%). For Liberal supporters, the top five issues selected were health care (69%), the economy (57%), jobs (29%), education (23%) and government spending and the deficit (21%). 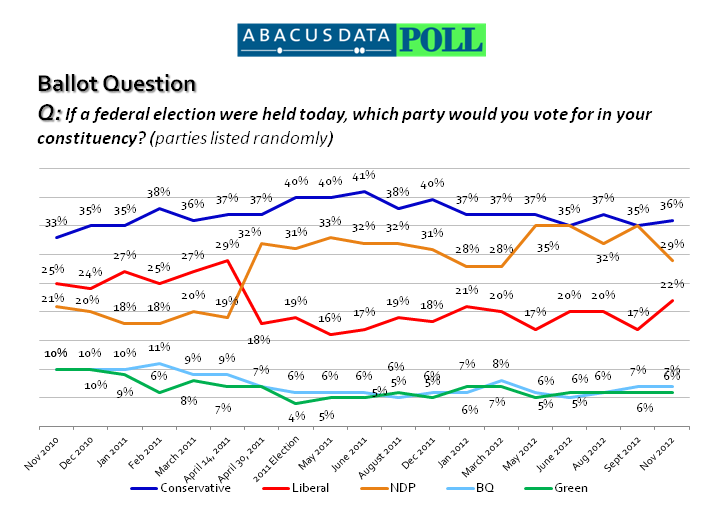 Along with vote intention and top issues, Abacus Data also tracks opinion about the general direction of the country, approval of the federal government, and the favourability of federal party leaders. 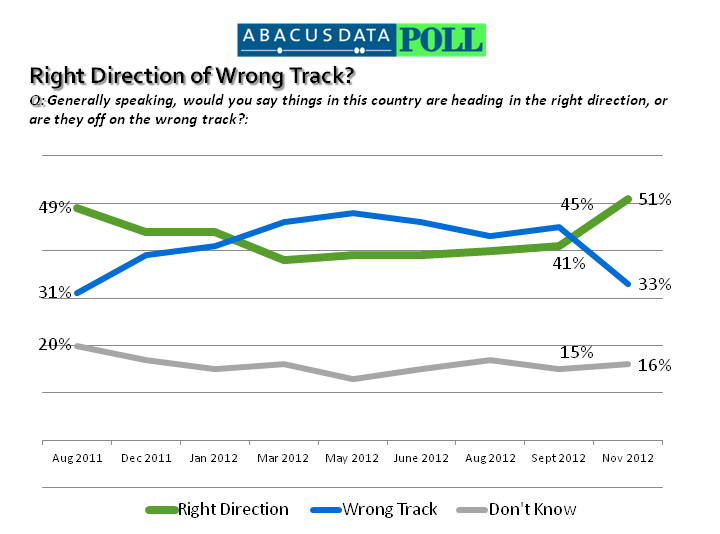 51% of Canadians surveyed believed that things in Canada are heading in the right direction while 33% believed things are headed in the wrong track. This is a significant change since September when 41% of respondents believed the country was headed in the right direction. Ontarians (55% right direction), and those living in the Prairies (63%) and Alberta (63%) were most optimistic about the general direction of the country. Despite a marked shift in the mood of the country, the federal government’s approval rating improved only marginally since September. This month, 39% approved of the job performance of the federal government compared with 44% who disapproved. Tom Mulcair’s personal ratings weakened slightly since September with 29% of Canadians saying they have a favourable impression of the NDP leader (down 7) while those viewing him unfavourably increased two percentage points. He remains the only federal leader to have a net positive favourable rating. Prime Minister Harper’s personal numbers remained relatively stable since September. The percentage of respondents who viewed the Prime Minister unfavourably declined four points to 46% while those viewing him favourably remained stable at 35%. Whether it is because of Barack Obama’s re-election in the United States or because of positive job numbers coming from the United States, Canadians are far more optimistic about the direction of the country in November than they were in September. A majority of Canadians now believe the country is generally heading in the right direction, a 10-point increase since September. Despite the rosier public outlook, the federal government’s approval rating nor the favourability rating of Prime Minister Harper have improved much since September. The right direction/wrong track measure is often a leading indicator for other measures and so it may take more time for these other measures to improve for the federal government. In terms of politics, Justin Trudeau’s entry into the Liberal leadership race has certainly buoyed the spirits of not only Liberal members, but also Liberal vote intentions across the country. At 22% support among decided voters, the Liberal Party is at its highest point in our tracking since the May 2011 election. For Tom Mulcair and the NDP, the Liberal Party’s growth has likely come completely at the expense of the Official Opposition. NDP support is down six points across the country with a notable decline in Quebec (-9), and Alberta (-11). The impact in Alberta will be negligible but a significant drop in Quebec means a likely loss of seats. This month’s results reminds me of the lead up to the 2011 federal election where the NDP and Liberals split significant portions of the centre-left, anti-Harper vote. With a seven point lead and a divided left, the rebirth of the Liberals and the maintenance of a sizeable NDP base would be a dream come true for the Conservative Government headed into 2015. We will have to wait and see whether the renewed optimism among Canadians and the bump in Liberal support holds over the next few months of tracking. The margin of error for a survey of 1,068 respondents using a probability sample is +/- 3.0%, 19 times out of 20.